Description: 2-Volume Set – The lectionary readings for the entire Christmas Season come alive through the stories and reflections of popular author Megan McKenna. Her words show us how we can center our lives on bringing justice and peace into the world while we wait for Jesus, the Son of God, to come among us. Description: The lectionary readings for the entire Christmas season come alive through the stories and reflections of popular author Megan McKenna. Her words sho us how we can center our lives on bringing justice and peace into the world while we wait for Jesus, the Son of God, to come among us. Description: Known as a scribe, minor tax collector, and public sinner, Matthew sought to create an identity for the fledgling Christian community as it struggled against persecution by the Romans and ostracism by the Jewish leadership. In her new book, well-known author and master storyteller Megan McKenna shows how this identity is forged of forgiveness, reconciliation and at-one-ment. What characterizes Matthew’s church is Jesus as the Mercy of God, as mercy shared. Matthew’s community becomes the presence of the kingdom of heaven on earth — the presence of God’s mercy on earth. In this masterful commentary, McKenna shows that, as it did for that early Jewish community of Christians, Matthew’s gospel offers balm and hope for the Church today. Description: New paperback edition! The Resurrection is the central mystery of believing Christians. 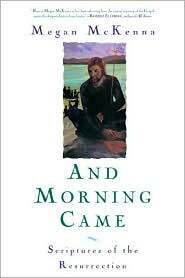 Through scriptural exegesis, cutting-edge scholarship, storytelling, and insightful interpretation, And Morning Came reveals that the Resurrection is not a single event but an ongoing experience of God’s grace and powr in our daily lives. In this masterful exploration through the Scriptures of the Resurrection, Megan McKenna helps us know each of the Gospel writers, understand the world they lived in, grasp the unique aspects of their Resurrection accounts, and see the connections these accounts have to our lives. Like Matthew, Mark, Luke and John–who wrote their accounts after the life, death and resurrection of Jesus has been experienced and the gift of the Spirit has come to guide the followers of Jesus–we are called to be inspired by this same Spirit and to both see and make real the incarnate God at work in the world from the moment of creation. In a world suffering from war, terror, fear, and economic hardship, this book is welcomed because it is, as McKenna states, “about living, about dying, about rising, about beginnings and endings and how to live resurrection now . . .” A profound book about hope from one of the most popular Christian writers of our time, And Morning Came is an adventure that appeals to the intellect, the heart, and the soul. Ecumenical in scope, it is a call to discover who we really are in light of God’s eternal love and to live our lives to the fullest.